Fusion or commercial style faucets are becoming ever more popular in the home, and manufacturers have started to realize this. On this page you will find a couple of the very best I have come across so far in my research. 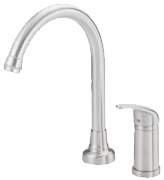 They have their own sense of style and if you’re someone who wants all the “bells and whistles” a kitchen faucet has to offer, these are definitely worth a look. They’re also great if you’re the type of person that doesn’t want the sink in your kitchen to just sit in the background. As you can see, these models really do stand out and will help you make a statement with the overall décor in your kitchen.